CM: Given the fact that everything now adays - whether pleasant or unpleasant - is recorded on a CD, Spyros Moschoutis presented an exhibition entitled CD on the Wall! in 2007. This artwork, which incorporates a CD, was reated one year later. The image is filled by a man isolated from his environment, sitting pensive with head in hands on a pavement. 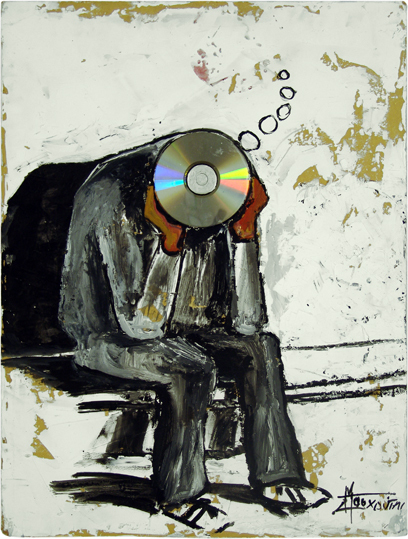 His black shadow seems to cry out loud in desperation the work's title "Let Me Be With My CD". The CD, replacing the head, has become a sort of his body's new extension and leads him to an electronic masturbation. This man is obviously suffering and there dose not seems to be salvation for him. The bubbles that come out of the CD are thoughts that evaporate into the air. While the CD has such great memory potential is actual fact it is empty and void.